Back when I was a teenager, and we lived in Germany, we used to take holidays down in Bavaria or Austria. It’s a part of the world I absolutely love with it’s high mountain peaks, thick forests, hidden waterfalls and springs, and amazingly beautiful castles and towns. It’s also a place where they don’t hide away from the horrors that came out of the region before and during World War 2. The rise of Hitler and the Nazis, the “hideaway” of the Eagles Nest at Berchtesgaden, and the concentration camp at Dachau. It’s 70 years since the liberation of the camp at Auschwitz-Berkenau, and it’s also holocaust memorial day, and that always makes me remember the time that we went to Dachau. Outside the gates of the camp you can hear the sounds of traffic driving by, birds chirping in the trees and children laughing and playing. Walk through the gates and it’s as if the very horrors of the events there cancel out all noise so that there’s utter silence. No cars, no birds, no laughter, even babies stopped crying. You are suddenly and brutally hit with the very nature of evil as you enter the camp and there were several people around us who cried just from entering – a sentiment I can fully understand, and I would probably do the same if I were to revisit today now that I understand more. The Germans themselves carried around the shame of that time with openness, humility, shame and a deep sorrow that runs deeper than I think any of us can imagine. But they are also a proud people, and in their openness they show themselves to be strong in their resolve to ensure that such events do not happen again and to also show that these were atrocities committed by a different generation, and not reflecive of the people now. Walking around the camp was an assault in the way that your senses, emotions, preconceptions and humanity were confronted with the pain of human suffering on the one hand, and the depths of human depravity on the other. That it is possible for one human being to commit such acts against another defies all humanity and you want to cry out that surely nobody could do such things – except you can’t as the evidence is there before you in the accomodation blocks, the work areas and the “shower” blocks. At the end of the tour was a museum with diaries, personal belongings, photographs and more. Those who hadn’t wept before couldn’t hold back as you saw the mountains of human corpses, the emaciated walking dead, the arrogant and haughty faces of the officers in charge. For those who were able there was a video reel available to view as you exited the museum. My parents gave me the choice, but I couldn’t face any more and so declined. My dad went in and when he came out he was broken. I’ve never seen such a haunted look on my dads face before or since, and in some ways that really cemented the reality of what we were experiencing. A couple of weeks ago the BBC ran a drama around the trial of Adolf Eichmann, one of the architects behind the horrors of the camps, and it brought it all flooding back. They included video footage of people and events at Auschwitz, as well as real footage from the trial, and I could do nothing but sit and weep. On this day I hope that we, the human race, sit up together as one and remember these events. And as we do so, let us all cry out “NO MORE” – and let us all resolve to never forget and to ensure that our children are taught the lessons and the horrors so that they may never be repeated. The years roll by and we should learn from history however we still see in differing countries the cleansing of certain groups of people. Even this year we see the Jews of France in fear of action against them. 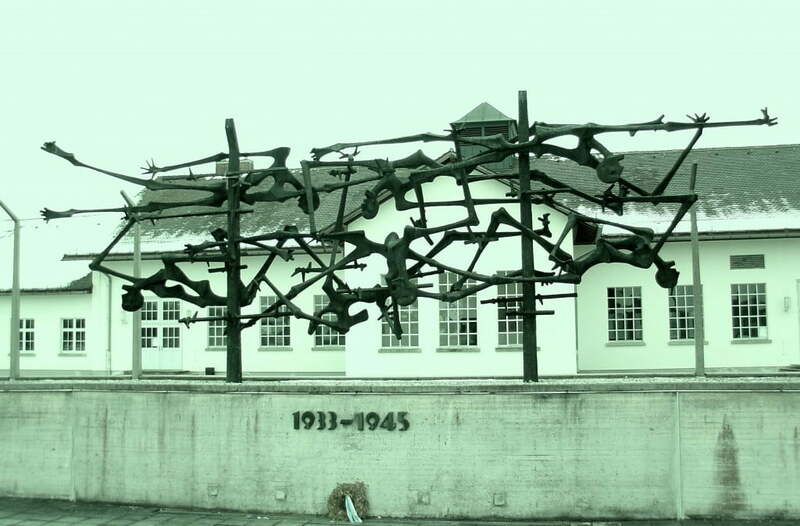 As we remember Holocaust day and the visit to Dachau it leaves its scars. The inhumanity of man to man was beyond belief and as we view all that was carried out by the people who ran the camps there was non worse than Auschwitz. There are those that say the past is the past and we should forget but if they were to look at the film history or speak to those who had to release the people out of a living Hell they would alter their mind. We must never forget or teach those following on of what happened and at the same time teach them how to treat others no matter their race or religion.